The W3C, the standards organisation responsible for core web standards, has a project, the web accessibility initiative (WAI ), that defines a standard for the creation of accessible web pages: the web content accessibility guidelines (WCAG ). In addition, U.S. federal agencies are required by law to meet section 508 guidelines on accessibility. Accessibility is concerned with ensuring websites are accessible to those with differing needs, in particular those with disabilities. Naturally, a website cannot be made accessible to all forms of disability, but with some work, they can cater for a large proportion of disabled users, such as blind or partially-sighted users. The basic premise, is that things implied to by visual artefacts, such as colour and position, are not universal for people with various forms of impairment, and by making information explicit in your HTML mark-up ('semantic' mark-up, because the structure now extends to conceptual structure, to a degree), you can make your site more accessible to them; for example, by explicitly linking the text associated with an input form field, a blind user (who is without visual aids) knows, without difficulty, what the field is for. Under U.K. law, and other jurisdictions, there is anti-discrimination legislation that covers the provision of services. It is arguable that this legislation covers designing websites such that they conform with accessibility standards. Therefore if you are a business operating in such a jurisdiction, it is highly advisable that you conform. by making sure that web pages are given a so-called semantic structure, they automatically become more usable on text-only web browsers. A system administrator needing to access an intranet externally via a remote console would find this particularly useful. forms become more usable, as you do not need to click directly on the sometimes small check-boxes, radio-buttons, and lists to activate them: you can click on any part of the label as well. This makes filling in forms a lot quicker, as less precision mouse work is required. A good way to test the quality of a website is to see if this is possible on it: on most it is not. by improving navigation for those who cannot navigate between links as fast as others, navigation is also sped up for others. For example, by creating a site-map, everyone benefits. Composr complies with the highest level of the WCAG (to the latest version at the time of writing, 1.0) guidelines, level 3. Few websites are close to reaching level 1, but our inbuilt webstandards checking technology allows Composr users to get an edge in this area. Composr also meets section 508 guidelines, the XHTML and CSS specification, as well as many other minor considerations that other software has no automated way of checking for. Composr conforms to these standards throughout – from screens that only users will view, up to those an administrator uses – and meets the highest level of the ATAG . After you have decided on the layout of your website, and created appropriate pages, you will need to create a site-map. The site-map is linked to from the bottom of every Composr page, and you will see that Composr comes with a default place-holder. The complexity of your site-map depends upon the complexity of your website. A small website may be able to just point the user to the left hand menu, while a large website should detail the full site structure, with links to all pages that should be directly accessible. It is possible to use Comcode in such a way that a page becomes invalid. Usually this is not something that would be accidentally triggered, as there is a correlation between common sense and webstandards checking for most of these scenarios. An example error would occur if you put a [block] tag inside a [url] tag: intuitively, this does not make sense, as a block could not be a sensible link title. It is also possible to degrade validation by creating different items of content that share the same title. For example, if two forums share the same title, it is likely that on the forum page there will by an error due to two separate links sharing the same link text. Composr avoids this when it is reasonable to think that two links may share a title, by providing additional distinguishing information for the link, but does not universally distinguish all links in the portal in such a way, as to do so would merely make the link-text closer to that of the URL, undermining the accessibility in itself by making them overly complex. To work-around this, simply try to choose distinctive titles for your content. This section will detail Composr compliance with the guidelines, with any relevant notes. The check-list is taken directly from the W3C specification. If the templates are edited, and conformance is still desired, then it is recommended that you enable the webstandards checker while editing templates (only staff will see the error messages even when it is enabled): the webstandards checker is of enormous practical assistance in finding and describing errors, for all relevant specifications. The table will detail any special information relating to how Composr is designed to work with some of the more tricky requirements. Composr webstandards checker ensures this is done. The web-master should avoid such content, including usage of the [ticker] Comcode tag, and possibly the [jumping] Comcode tag. Composr can provide an accessible page, and the user can add such a link if they wish. Composr is designed to high graphic standards that precludes such bad contrast. Composr complies (SVG statistics, for example). Composr complies. Note that this does not totally preclude using absolute units, just when they are better replaced with relative units. Composr webstandards checker prevents fonts from having absolute size. Composr complies (menus for example). Composr complies (main_quotes for example). Composr complies, except for hidden refreshing iframe's which are necessary to specific functions. 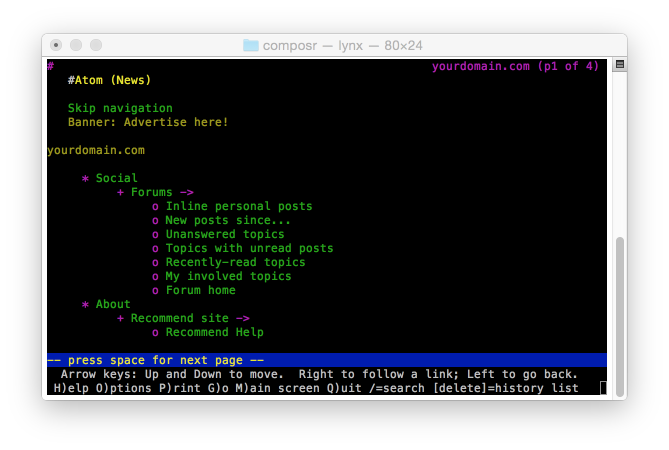 Unlike most web systems, Composr will not show “you are being redirected” pages. Refresh is either automatic (often via the location header), or a user must confirm by clicking a continue link. Composr complies. Note that despite the wording of this check-list entry, it is allowed to cause a pop-up when there is sufficient warning, which Composr always provides. Composr provides automatic sitemap generation functionality, a default sitemap page, and an advanced menu editor. Composr complies. Note that layout tables are allowed, but Composr hardly uses them anywhere (only when a CSS limitation needs to be overcome). When attaching a label is visually impractical, an invisible label is rendered: this should still be available for technologies such as screen-readers, but be invisible under ordinary use. Composr webstandards checker ensures this is done where possible, and Composr complies. See 6.4. Some features would not be available without a mouse, but these are always unnecessary. 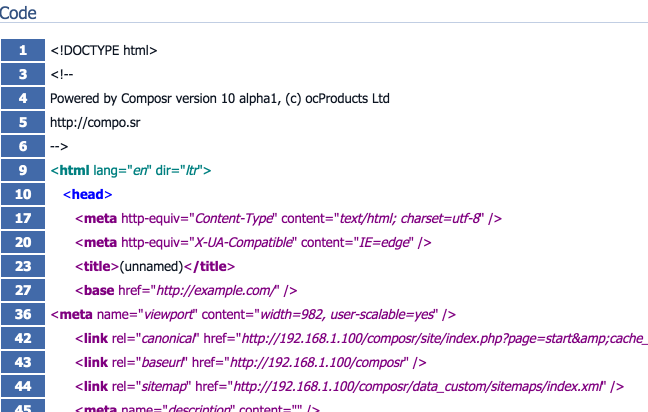 Composr complies, and to an extent, the Composr webstandards checker ensures this is done. 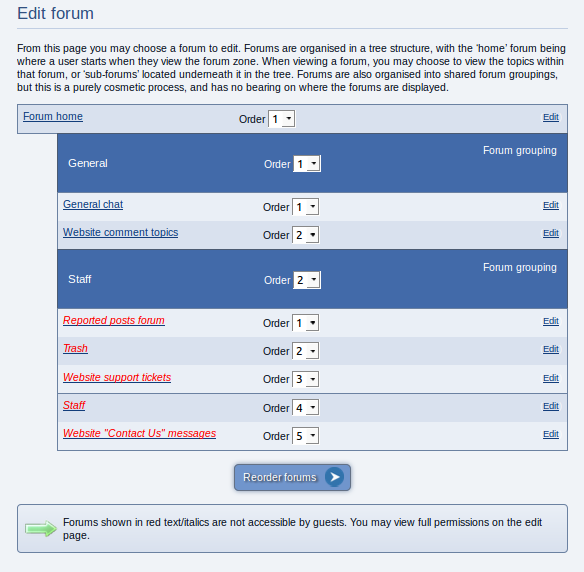 Note that most applicable elements have no specific tab-order, as the automatic order suits. In order to achieve it, <span style=”display: none”>, </span> is often used in templates. This is invisible, but semantically present: hence allowing visual style to be unaffected, but providing an aid for screen-readers. Composr complies (the language block, for example). Composr complies (the menu system, for example). Composr complies (search page has advanced options, but not immediately available). This is a very particular point. Not applicable. Composr webstandards checker ensures this is done. Standard layout strings show the form of the table. Layout tables have an empty summary. Composr webstandards checker ensures this is done when an abbreviation is needed (long header labels). To achieve this, we often put a code-name into the <th> abbr attribute. While this is biased to English, it is an abbreviation and does solve the problem at hand in an appropriate way. Assistive technologies now provide this. Macromedia Flash is inherently inaccessible to those with certain kinds of disabilities, because it assumes that the web browsing is a visual, mouse-orientated experience. While Flash does not deserve harsh criticism for this (almost all of traditional desktop interfaces make the same assumption), it is inferior to well written (X)HTML from the accessibility perspective. HTML's document model of interfaces provides the 'semantic' structure that allows web pages to be accessible. Therefore, to make an accessible website, Flash should be avoided for anything other than auxiliary usage that XHTML could not reasonably achieve. Web designers often abuse HTML tags in order to achieve visual side-effects that those tags come with. The blockquote tag is intended to markup quoted information, but has the side-effect of indenting text. Web browser technology designed to assist those with disabilities may make use of the so-called 'semantics' of a documents markup in order to better express it to the user, but the user would be misled in situations where such markup was used incorrectly. Preferably, the CSS information would be moved into its own named class, with the properties stored in the global.css styled sheet (so that they may be easily edited at a later date, or overridden if the user has their own specially designed 'override' style sheet), but this is not nearly as critical as the misuse of markup. Writing skills are important for a website targeted at the general-public, and especially so when a segment of the audience have cognitive disorders. Here you will find forums, chatrooms, and I will post the latest news that our team has for you. We especially envision provisioning the latest information pertaining to Consuperrabiotriaxilator for the esteemed reader. This is the website of Virtual Mega Cyber Products, developers of Consuperrabiotriaxilator. While this example is somewhat ridiculous, it is not actually far from the reality of many ill-considered websites. Not providing any useful information in the titles. These occupy large amounts of space, and an opportunity wasted if not used effectively. Assuming the reader knows information that they probably do not. Not providing the most key information near the start. Using pretentious language that only aids to confuse rather than impress. Using complex terminology without explaining it. These issues go beyond accessibility, and are very relevant to the marketing of your website: never over-estimate the attention span of your reader, or their ability to realise what is obvious to you. All tags that are opened must always be closed, yet the two p tags have not been. Tags must not overlap, yet the font tag is defined in the first paragraph, and extends after that paragraph has ended. The font tag is not present in XHTML-strict. All attributes must be quoted, while the color attribute is not. While none of these issues are directly related to accessibility, the strict adherence to the latest XHTML and CSS specifications increases the accessibility as the standards are increasingly designed for it. Clearly defining where tags start and end allows user agents more certainty over the correct interpretation, and hence they can be better expressed non-visually. While there are rules for interpreting HTML in a way that is fully expressed, there is no guarantee that the author's intent is that of the interpretations assumption. Overlapping tags might make sense visually, but are unnecessarily complex when expressed non-visually. CSS is preferable to the use of the font tag because the user may override the presentation with that of their own; for example, a user could increase the contrast between certain colours by overriding part of a CSS class. Using a simple and consistent strict grammar makes document markup easier to read and understand, and hence reduces the chance of making other errors due to the reduction in distraction. If visually scanned, it is obvious how this table is laid out. However, non-visual user agents would read out each data cell with equal prominence and the user would need to build up an understand of it themselves based on this raw 'linearised' stream of information; this is especially problematic when data tables and layout tables are mixed without any distinguishing marks. If properly marked-up, the user would get an understand with greater ease. While this might seem a minor issue, it is in fact very important because it lowers the burden for a user who is likely to have many other problems that are less avoidable. You will find a number of options in Admin Zone > Setup > Configuration > Accessibility options, for tuning the webmaster experience to meet particular accessibility requirements. Web Accessibility Initiative; a group working under the W3C who are the official standards organisation behind the world wide web. Web Content Accessibility Guidelines, as written under the WAI. Roughly means 'meaning', and often used as the opposite to 'syntax'. Semantically constructed web pages have well considered structural definition, leading to some aspects of meaning in the layout. Accessibility legislation similar to WCAG, that applies to US federal institutions.